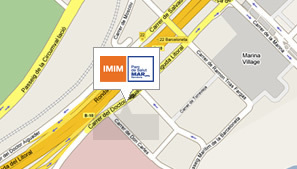 The IMIM is located in the Barcelona Biomedical Research Park building at Doctor Aiguader Street number 88 of Barcelona , overlooking the Ronda del Litoral, next to the Hospital del Mar and close to the twin towers of the Olympic Village: Torre Mapfre and Arts Hotel. Passeig Marítim is the street of the Hospital del Mar (next to PRBB building). Bus number 14 stops in front of the subway L-4 (yellow line). Bus number 36 stops almost opposite to the PRBB building. Bus number 41 leaves you a few minutes walk from the Institute at the stop in Avinguda Icària, between Joan Miró and Marina Street. Take the Ronda del Litoral, 'Besos direction', and leave the Ronda at exit 22 (Barcelona-Hospital del Mar-Vila Olímpica). You will easily see the PRBB building on your right. If you are travelling to Barcelona by car and approaching the city along the motorways from the North or the A-19, take the Ronda del Litoral, 'Llobregat direction'. Leave the Ronda at exit 22 (Barceloneta-Pla de Palau-Via Laietana). You will see immediately the PRBB building to your left. Continue another 150 meters, positioning your car on the left-hand lane and, at the first traffic light, turn left. Continue along the lateral lane until you reach the Institute (be careful when turning left not to re-enter the Ronda del Litoral).